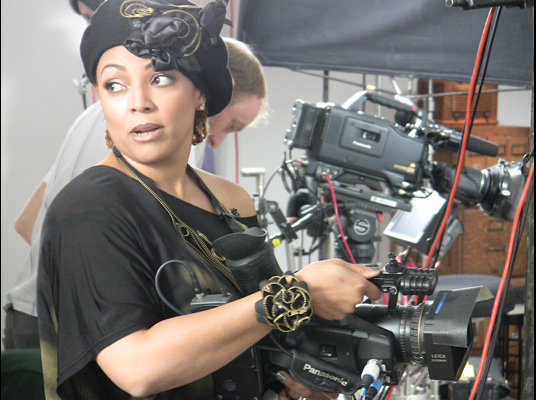 Kim Fields comes from an acting/directing /producing dynasty that rivals any in Hollywood. After receiving the acting bug from her mom, seven-year-old Kim and Chip (her mother) ignited a path from their native Harlem to LA determined to find success in show business during a time when black faces on the big and small screen were a virtual paradox. Kim’s luminous smile and personality secured her roles in commercials and eventually landed her the role of Tootie Ramsey on The Facts of Life. Chip built a solid career as an director, consultant and dialogue coach and has appeared in numerous films, TV shows and theatre. After 30 years in the entertainment industry, the course Kim and Chip paved allowed for countless black actors and actresses, including baby sister Alexis, to shadow their footprints. Members of Gen X grew up with Kim, watching her on The Facts of Life. As twenty-something’s, we watched her play bougie Regine Hunter on Living Single. She became a part of our extended family and thanks to syndication, she is becoming known to Gen Y and future generations. As Blondielocks, she has added another notch in her career as a poet and spoken word artist. For the past year and a half, Kim has been the lead director for Tyler Perry’s Meet the Browns and House of Payne. This winter she will embark on the role of supervising producer and director for an upcoming Tyler Perry comedy. Along with juggling a work schedule that must have her calendar bleeding with ink, she also balances the duties of being a wife and mother. The elevator doors opened to Gary’s Loft, located on 28-30 West 36th Street, to expose a space almost deaf with silence –only the faint voices of Kim and young female documentary filmmaker could be heard from around the corner while the crew meticulously worked to get the interview completed in one take. The footage would be used in an upcoming episode of Lens on Talent: A Johnson & Johnson Filmmaker’s Challenge, BET’s ground-breaking show featuring the best emerging black filmmakers and short films. Besides making sure my platform sandals do not clunk against the wood, I became aware of the love permeating throughout the room. As the crew watched the footage on monitors, whispered and tip-toed about and members of the media quietly waited to meet Kim, the emotion seeped into my pores and left me agog. There were no divas on the set; everyone was devoted to the success of this project. Just as quickly as I noticed the temper of the room, I also realized that Kim was the source behind the affection that had swept the penthouse. She stood in a black blazer and skirt and camouflage heels, a tiny force of nature in a blonde natural updo. She walked over to me and the other members of the press, introduced herself and shook our hands, her 10,000 watt smile beaming even brighter in person. I chuckled inside saying, “Girl, I know who you are.” Or maybe I did not. 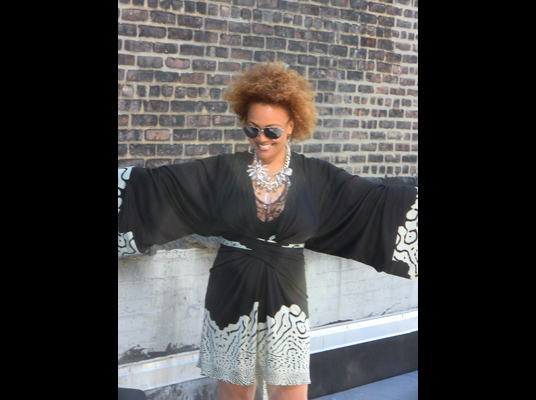 Suddenly it struck me, Kim Fields is no ordinary mortal –she is a superwoman. Not the facade illustrated in comics, but the kind women aspire to be, a woman in harmony with her feminine, spiritual and professional self. Most people are familiar with the phrase, “Those who can – do. 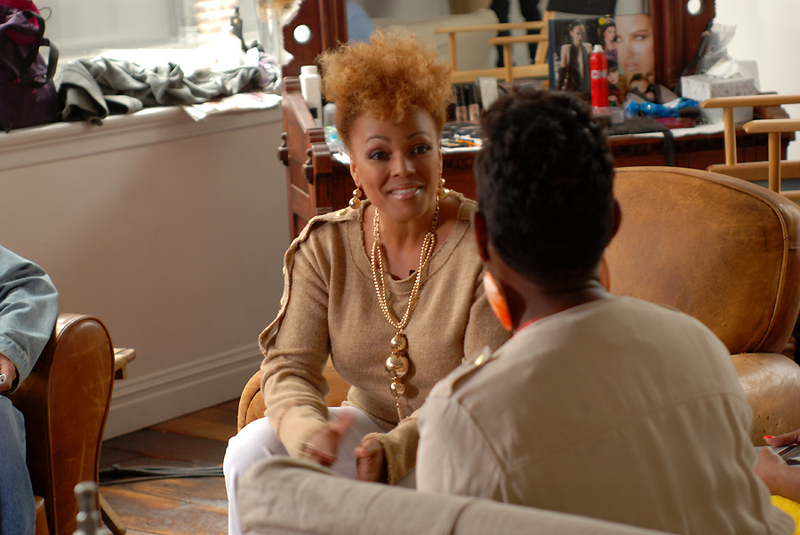 Those who can’t – teach.” I believe a perfect host straddles that famous sentiment, so when BET went shopping for a new host for its second season of Lens on Talent, television legend Kim Fields was a logical, insightful choice. “I actually was approached over the summer to do some social media hosting and my big brother Blair (Underwood) was supposed to be the host for season two,” Kim reveals, “and we did a panel discussion at NYU that Johnson and Johnson sponsored. And Blair, as you know, is now the face of the president on The Event and wasn’t able to do both schedule wise, and they said, ‘Hey, what about you.’” Kim was familiar with the show’s concept and admired Johnson & Johnson’s eagerness to shine a spotlight on urban talent and realizing that she had time in her schedule before she goes back to work at Tyler Perry Studios, she accepted. After decades of acting, Kim made the decision to start directing. Kim always had an interest for the behind-the-scenes processes of filmmaking and describes herself as a “crew baby.” Although she admitted that being an actor assisted in her transition, she was determined to become a well-rounded director, able to attend to the needs of the actors and the crew. Therefore, learning the technical and visual aspects of directing was equally important. For the young filmmakers selected to be a part of Lens on Talent, the opportunity to meet and chat with an industry veteran who knows what it is like to be in front of and behind the camera must be thrilling experience. But for the aspiring directors that will be watching the show, Kim has some advice, “You gotta learn the craft, whether you learn it in a film school, read about it online, get a book, intern at some production company or on film sets,” she says, “and then surround yourself with people who know what they are doing. I’m a huge sports fan, and I liken what I do sports. You don’t just have a great star player here or there, you’ve got great coaches and a coaching staff and then you’ve got the front office. It’s really a team effort.” Although Kim has been taking on more projects behind the camera, her love of acting has not diminished. “I’ve not retired by any means as an actor just because I’ve been directing more,” she says. The projects she chooses are determined by scheduling and the figures on the contract. As the afternoon continued, Kim shared her thoughts about being a black actor in Hollywood and starring in a reality TV show – quick answer no. Still convinced that her golden lasso and bracelets were tucked safely in loft somewhere, I inquired about how she became a flesh and blood superwoman. 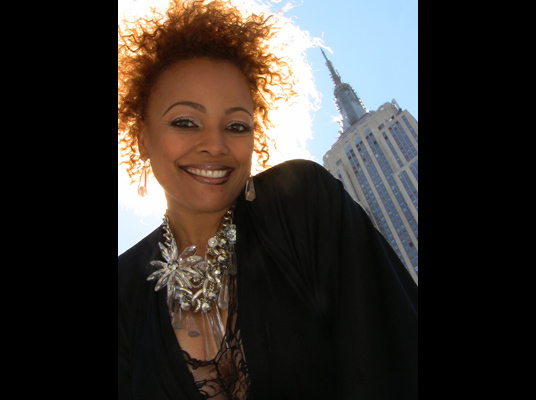 Superman jumps skyscrapers with a single leap and catches bullets with his teeth, but Kim Fields acts, directs, produces, hosts, writes and performs poetry and publishes short stories all while maintaining the commitments of a family. Kim dispensed a jewel for anyone looking to achieve an order of balance. “Balance does not always mean fifty-fifty,” she quickly points out, “balance is a constant teeter-tottering of the scales. So sometimes it’s a matter of if I know I’m work…work…work…work…work, then there’s time that Sebastian and I specifically have that’s mommy and Sebastian time. Same thing with Chris, you can’t pour so much into your child that you forget you’re still a spouse and a partner and a helpmate. And sometimes you’re gonna get out of rhythm, but what you do about that I think is what’s equally as important.” As our media round table wrapped, Kim thanked all the journalists, gave us one last peek of that effervescent smile and then it was off to do another set of interviews. I may never know if she holds any special powers outside of the gifts she possessed and honed from birth, but after smelling the scent of soul food wafting through the loft, I know Kim does one thing that every mortal does – she eats.